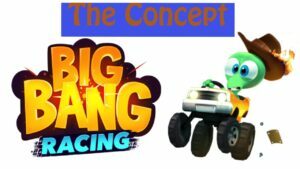 Big bang racing is a arcade puzzle game presented as a unique racing game with elements of Adventure and social media taking the centerstage of the game. 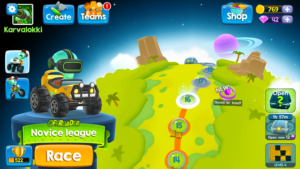 The player plays on tracks designed by other players and collects treasures which in turn helps the player unlock higher levels, customise the character and Climb the leaderboard. The Tracks include High jumps, Puzzling driveways, Anti gravity wind tunnels, bombs, Traveletors and many more interesting bits. 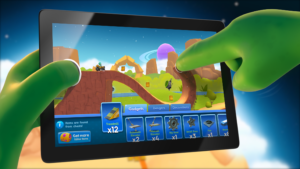 Gameplay requires the player to think on there toes, mindless accelerator race and hoping on will not win you the race, the player needs to calculate the accelerator, the jump height or the flip angle, all these factors count and this makes the game more challenging. the vehicle physics is very very realistic. 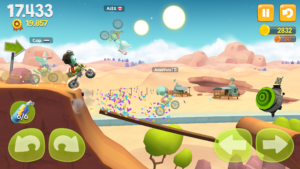 The social aspect of the gameplay is very strong, almost all the tracks are user generated and you will be competing against the lap time of somebody else around the world, so in short you will be playing a user generated track against an user generated leaderboard. 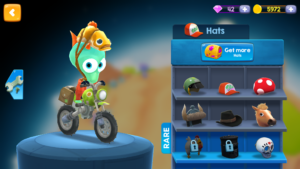 The graphics are minimalistic, the vibrant colours and the round edges gives the game a very cute look, the rendering is smooth but in some cases we can see the graphics shuttering, we believe this is a hardware issue since we are using an iPhone 6 Plus which is a two+ year old phone. 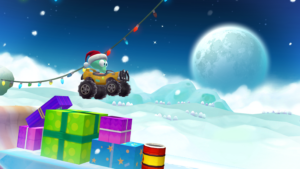 The vehicle Physics, the the jump trajectory, the vehicle shock absorbers, vehicle traction every aspect of the game is top notch and keeps the player wanting more.